We have a lot of news to catch up on after missing yesterday’s Morning Links. We’ll get to as much as we can today, and the rest Monday to make sure you don’t miss anything. Sad news from the South Bay, where the Easy Reader News reports longtime bike advocate Julian Katz has died of prostate cancer at age 88. A memorial ride in Katz honor will leave from the Manhattan Beach Pier at 10 am tomorrow. You can make a tax deductible donation in Katz honor to support bicycle safety for students at 186th Street Elementary through the South Bay Bicycle Coalition. Nice LA-based ad from Rapha says riding is the answer. Or as Adweek puts it, life is less crappy when you get off your phone and on a bike. A road raging Sacramento driver did what nearly every bicyclist has wanted do at one time or another, but had the sense not to. He repeatedly rammed a parked car with his SUV, before getting out and jumping on the roof until police came to take him away. LA Mayor Eric Garcetti has pledged a carbon-neutral Los Angeles by 2050. Which won’t be possible without a major increase in bicycling and walking, as well as dramatically increased density. But it sounds nice, anyway. You may still have time to make it to the East Side Riders Annual Appreciation Picnic at Athens Park this morning. A new bicycling themed coffee shop called Super Domestic has opened across from Sony Studios in Culver City. Santa Monica proposes a cap of 1,500 e-scooters in the city, eventually rising to 2,250; operators would have to pay a $20,000 annual fee, as well as $130 per scooter. Six bicyclists on the AIDS/LifeCycle Ride were treated for eye irritation after they were gassed with tear gas that drifted across the road from the federal prison in Lompoc. Santa Maria has rejected claims filed on behalf of a woman’s husband and her three kids after she was killed by a city bus while riding in a bike lane. A fundraiser is being held for a Reno mountain biker who was injured after crashing into a pair of LimeBikes that had been improperly parked in a bike lane. Bicycling lists nine “totally awesome” charity rides around the US. GQ tells you everything you need to know before buying a bike for fitness. Best advice: Give your favorite wrench a beer or two. Men’s Journal reviews the best bike locks. Good question. Treehugger wants to know why ebikes don’t get the same kind of government support electric cars do. Salt Lake City has a new bicycle-themed bar for people who like bikes. Or appreciate long, twisty mustaches. Colorado National Monument puts up signs warning drivers about bikes on the road, as part of a test to see if they’ll actually slow down. The drivers, not the bikes. Or the signs. They get it. Business owners in Butte MT are pushing for more business from bicyclists. LA bike riders get Clif Bars for Bike to Work Day; Wisconsin riders get Bacon on the Bike Path. Chicago police are using bicycle traffic stops to make gun and drug arrests in communities of color. Which is just one reason why City Lab asks if it’s time to reconsider traffic stops. A memorial has been unveiled for the five victims of the Kalamzoo massacre. A Dayton, Ohio man was killed when he rode his bike into oncoming traffic while fleeing from police, because he didn’t want to be jailed and miss the birth of his first child. Now he definitely will. A Maine bike rider spent seven months tracking down the nurse who saved his life after he severed his jugular crashing into a parked car while riding with his head down. Boston decides to make its bus and bike lane pilot project permanent. A Queens community council votes to block plans for a protected bike lane where a rider was killed last year. Unbelievable. An Atlanta bike rider struck by a truck whose driver had been shot in the head, after a man fired warning shots during an argument a block away; fortunately, both victims survived, though the driver is in critical condition. Road.cc looks at the best mudguards to keep your backside dry. Heartbreaking story of an Ontario bike rider on a charity ride who stopped to help a rider who’d fallen after blowing a tire, then was killed when a driver plowed into him and three other people on the side of the road. Eight Quebec cities to add to your bicycle bucket list. A writer for the Guardian says the London mayor’s time in office will be a failure if he can’t overcome a vote blocking a proposal to turn the city’s busy Oxford Street into a pedestrian mall. A London bike rider lets his air horn do the talking when people walk in the bike lane. Seriously, don’t do that. Sad news from Wales, where a mountain biker was killed crashing into a tree on a trail he designed himself. The war cars may be a myth, but the war on bikes goes on. A Welsh rider was knocked unconscious after someone tied a string at neck height across a bike trail. And no, it’s not a sick prank; it’s a terrorist attack intended to injure or kill innocent people. Caught on video: A British driver appears to deliberately swerve into a teenage bike bicyclist who was riding on the wrong side of the road, then threatens the woman who took the video. Life is cheap in the UK, where a 20-year old driver gets off with community service for killing a bicyclist, despite driving on the wrong side of the road with a clear view of the victim for at least 45 seconds prior to the crash. A Dutch city will get the world’s first bike path paved entirely with recycled plastic. A new bill under consideration in Australia would compensate bike riders for injuries suffered in a dooring or a collision with a vehicle, whether moving or parked. Better yet, it’s retroactive to 2014. Thai bicyclists could be fined the equivalent of $15 for riding under the influence. But only if they’re caught on a main road; evidently, riding drunk on secondary road is fine. Awareness of the dangers of concussions is spreading through the pro peloton, but Rouleur argues the testing protocol needs to be made mandatory. Britain’s most successful women’s mountain biker says her brothers were the ones who convinced her the sport was for girls. Fallbrook pro cyclist Roger Ainslie has been banned for three and a half years after failing a drug test at the US Track National Championships. But sure, the doping era is over, right? 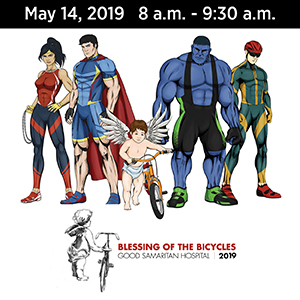 The Department of Defense — yes, that Department of Defense — writes about the bicycling competition at the recent DoD Warrior Games at the Air Force Academy in Colorado Springs CO.
Nice profile of Lance Armstrong, post legal settlement with the federal government. If anyone still cares. So maybe a no riding zone isn’t the best place for a bikeshare dock. When the new safety signs aren’t. And when you’re invited to a garden party at Kensington Palace, by all means, ride your bike. Thanks to Mike W for his generous donation to help support this site. Morning Links: LA County settles Milt Olin case for $11.75 million, and sheriff’s deputies get it wrong on PCH. Again. Five and a half years after music executive Milt Olin was killed by a distracted LA County sheriff’s deputy, his family has finally received some justice. According to the Los Angeles Daily News, the Olin family will receive that amount in a settlement from the county. Which is just slightly more than the $80,000 requested in their original lawsuit. But possibly less than a jury would have given them if the case had gone to trial. Olin was riding in a bike lane on Mulholland Highway in Calabasas when the deputy ran him down from behind while responding to a message from another officer on his onboard computer. That came just moments after the deputy had been texting with his wife while driving. Which, remarkably, is legal for emergency personnel in California, even if the text has nothing to do with official business. The LA County District Attorney refused to file charges in the case, or to hold the sheriff’s department accountable in any way for a policy that allowed deputies to use the onboard computer while driving, with predictable results. That policy was changed as a result of Olin’s death. Which, in the long run, may be worth much more than his family will receive in this case. Photo from the Milt Olin Foundation website. 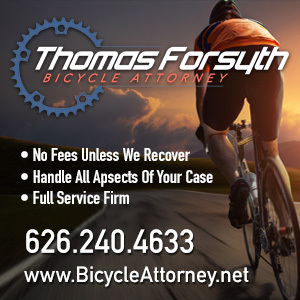 Every few years, Malibu sheriff’s deputies insist on harassing and ticketing bicyclists who are doing absolutely nothing wrong, based on a flawed interpretation of California law. And after various bicyclists, bike advocates and organizations explain the law to them, they back off. Until the deputies are transferred out, and new ones come in to take their place. Like it did this past weekend, when members of the Major Motion Cycling Club were harassed by a sheriff’s deputy, who used his loud speaker to insist that they ride single file in a non-existent bike lane. So let’s go through this one more time. CVC 21202 allows bicyclists to ride in the roadway, using the full lane when necessary. Bike riders can, at their own discretion, ride on the shoulder of a roadway. However, nothing to the right of the limit line is legally considered part of the road, and bicyclists can’t be required to ride there. And just because there’s a stripe on the side of the road, that doesn’t make it a bike lane. It’s true that CVC 21202 requires anyone using a bicycle to ride as far to the right as practicable — not as far as possible, as it’s frequently misinterpreted. However, it contains a number of exceptions when the ride-to-the-right rule does not apply, including in a substandard traffic lane. That means any lane that is too narrow to safely share with a bicycle and a motor vehicle, while allowing for a three-foot passing distance. Like the lane shown in the video, which is clearly too narrow for a bike and a car to safely travel side-by-side. And like most of the other right hand traffic lanes in the LA area. There is also absolutely nothing in California law requiring bicyclists to ride single file. The CHP and LASD have often attempted to misapply the ride-to-the-right rule in CVC 21202 to say that anyone riding abreast is not riding as far to the right as practicable. However, as we noted, that requirement does not apply on a substandard lane. It is actually safer to ride abreast under those conditions, because it increases the visibility of the riders and allows them to control the full lane, forcing drivers to change lanes to go around them. And it makes the riders easier to pass by bunching closer together in a small group, rather than stretching out in a long line. Finally, it’s impossible to obstruct traffic on a roadway with two or more lanes in each direction, where drivers can simply change lanes to go around. 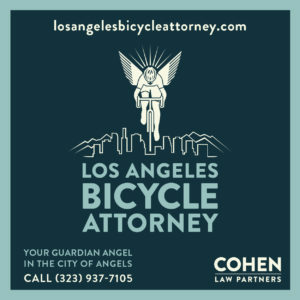 Below is the video the LAPD prepared to train its own officers in bike law and the rights of bicyclists. Which should be required viewing at the Malibu/Los Hills sheriff station. Thanks to Martin Blount for the video. An aggressive, road raging California driver flips off a bike rider and makes a punishment pass for no apparent reason. Los Angeles police solved just 8% of hit-and-runs in the city last year. Which means 92% of hit-and-run drivers committed a crime and got away with it. But sure, let’s keep pretending it’s not a crisis. 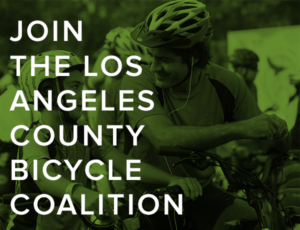 The SGV Connect podcast discusses how to support people who bike at the University of La Verne. Registration is open for this summer’s Tour de Laemmle, the annual 135-mile ride along with Laemmle Theaters president Greg Laemmle as he visits all of the theater chain’s nine LA area venues. No surprise here. San Diego drivers are taking advantage of a new bike lane in Mission Valley for prime parking space, forcing riders out into high speed traffic; police are ticketing the cars even though No Parking signs haven’t been installed yet. A San Francisco woman asks if bike riders are really welcome in Paso Robles after a road raging driver threatens to run her and her husband down unless they ride single file. Which they were. A San Francisco supervisor follows through on threats to remove a bike lane to make room for more free parking. Don’t ride your e-scooter on the San Francisco Bay Bridge. Or any other freeway. Distracted driving gets the blame for a 13.5% jump in traffic fatalities in the US; the United States was one of just five nations to see an increase in traffic deaths over a five year period. Streetsblog says fire departments are now embracing safer street designs, rather than fighting much needed safety improvements. An Oregon letter writer says bicyclists should be held to the same standard as drivers. So feel free to roll stop signs, ride through intersections after the light has changed, never signal, and ride ten miles over the speed limit while texting, just like the people in cars do. A retired Los Angeles man says he’s given up on bicycling in the city, driven off the streets by road raging drivers, and moving to Tucson to take advantage of the city’s 131-mile off-road bike and pedestrian loop. Someone should send that to every member of the city council so they can see what we have to deal with on a daily basis. A group of Ukrainian cyclists is passing through New Mexico on a ride across the US to promote adoptions. Iowa bicyclists call for a law requiring drivers to change lanes to pass people on bicycles, and increased penalties for driving distracted. A Chicago bike rider somehow assumes that bad bicyclist behavior is responsible for a dramatic increase in bicycling fatalities, and calls on his fellow citizens to yell at the miscreant riders. Doctors in New York were able to save the leg of a nationally ranked junior cyclist after he developed an aggressive form of bone cancer, saving his dreams of competing in the Olympics. A marathon runner is suing New York for $2 million after he broke his arm in a collision with a bike rider on the George Washington Bridge, claiming there’s not enough room for people on bikes and on foot on the bridge. A Pennsylvania newspaper reminds drivers about the state’s four-foot passing law, and says there’s no excuse for disobeying a perfectly sound law. The Voice of America looks at DC’s monthly Bike Party. Apparently having solved the problem of distracted driving, Miami considers a campaign to reduce distracted bicycling, skateboard and moped riding. No, really. Horrifying story from Ontario, Canada, where a man is fighting for his life, and a woman seriously injured, after a driver slammed head-on into four bicyclists on a charity ride; the driver was attempting to pass a slower vehicle, and reportedly never braked before hitting the riders. A Canadian city is taking bikeshare to the next level by offering a free bike lending program, allowing users to check a bike out for a day. In a bizarre comment, the head of London’s department of transportation apologized to drivers for the city’s hugely successful cycle superhighways, saying they were poorly thought out and rushed through under the previous mayor. Although he may have been talking about the construction delays, not the bikeways themselves. London’s Independent recommends six of the coolest cycling destinations around the world to add to your bike bucket list. When is a bike lane not a bike lane? When it can convert to other uses at different times of day, thanks to a new concept from a London design engineering firm. The war on cars may be a myth, but the war on bikes continues. Someone reportedly sabotaged a UK mountain bike trail by stringing wire across it, as well as placing logs and other obstructions on the trail. Bike advocates in Malta complain about a limited and disconnected bike lane that doesn’t meet European standards. Proving once again that bicyclists face the same problems all over the world. Over 82,000 people in Australia have signed a petition to require bicyclists to ride single file when in a group, and ban bikes from roads with speed limits over 50 mph. A member of the US Paralympic Cycling Team credits riding with lifting him out of a decade-long depression that began when he suffered a stroke as a teenager. Britain announces a new campaign to stop doping and ensure public faith in cycling. Maybe they could start by taking a closer look at Team Sky. I’m just saying. Five-time Tour de France winner Bernard Hinault doesn’t hold back, saying Team Sky star and Giro champ Chris Froome doesn’t belong with the legends of cycling, and shouldn’t be allowed to compete until his doping case is resolved. It’s now legal to bike through the drive-through for a Portland burger. Putting school parking — and senior pranks — to better bikeshare use; thanks to Campoy for the link. And we’re not in danger of being replaced until these little guys learn to hold their line.